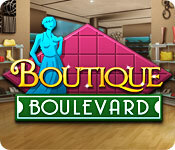 Boutique Boulevard is rated 3.6 out of 5 by 76. Rated 5 out of 5 by writer3 from Fantastic game!!! I REALLY, REALLY enjoyed this game! One of the best shopping games out there! You get to design your store in between serving the customers. It's a MUST BUY as far as I'm concerned. Please come out with a sequel!! Rated 5 out of 5 by africanrose32 from I would buy it It has the right combo of adventure and challenge and fun story. 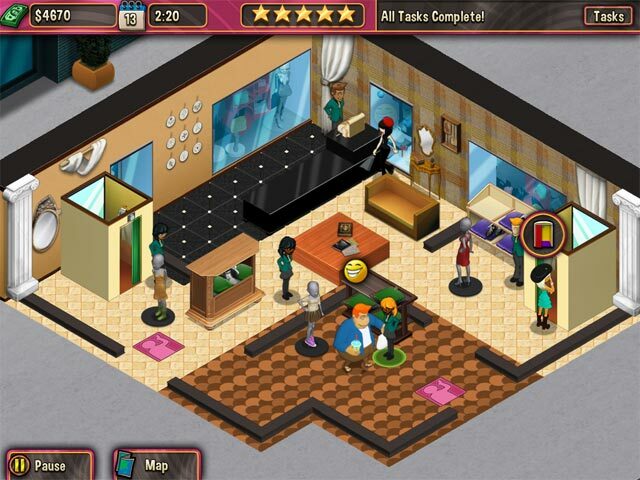 Rated 5 out of 5 by tirandamaylor from Boutique Boulevard Great time management game! I Loved it! The upgrading options were awesome! Rated 5 out of 5 by MidnightClover from Fun Each store is kind of similar, but I like how you can set your employees up at the beginning of the day and only have to move one around. Dragging them around is fine since watching your employee snail walk around the store can grow irritating. Rated 5 out of 5 by payae from Love this game This game is oh-so-much fun!! Kids and adults will love it! Not only does it give you a lot of challenge, but also makes you think, strategize, and organize. Definitely 5 stars! Rated 5 out of 5 by SilverBranch from Another great Boulevard game Like Bistro Boulevard, this game allows you the freedom to decorate your space as you see fit, train people and instead of unlocking ingredients to make dishes, you're unlocking garments to make outfits. This Boulevard game is a little more hectic in that you manage your staff during the levels (unlike letting the waiters do everything in the bistro version), but it's an okay TM. I really enjoy these games and hope to see another Boulevard style game soon! Rated 5 out of 5 by HawaiiGamer from Good Paced Game, not crazy like the "Dashes" Firstly I am NOT into hectic TM games like the Dashes. If you love going crazy this is not the game for you. It is much more chilled and one can take their time to build up to it. I think any future games from this company will be compared to Bistro Blvd. To me, BB was more difficult in terms of trying to figure out the recipes. Since these are outfits it's slightly easier but I've made mistakes in unlocking the right sets. On my screen the black/greys, like the Expensive Suit set, is difficult to see so it took forever hunting for the sunglasses #which are w/ the Suit#. Also the Cos play set, with the cat's ears easily gets mixed with the hairbow. I love fashion, I love slower paced TM and so this is a perfect game for me. I do find the bubble noise annoying after playing the 2nd store. I also wish like in the forums, an upgraded dressing room and cash registers. With only one register/dressing room, the customers get easily irritated if they wait a few microseconds. I do like The Sims ability to change walls and floors. And since I'm on the 2nd store only, it's not like BB, where one has to figure out the layout to squeeze in the maximum amount of tables for guests. The first play is a bit difficult because like BB. one doesn't have a lot of money to upgrade and buy in the beginning to get the higher scores/monies. So this one is a little more hands on but like other TM games one has to move the 'workers' to place to place anyway. Again, I don't think this game would be for those who like a frentic crazy, adrenalin filling pace. It is hard to find these more slower paced games. But please don't think that this is dull, I find it quite challenging and FUN. I bought it 22 minutes into the demo. Rated 5 out of 5 by Encee from Excellent Fun! This is such a nice time management game that I stayed with it and completed the entire boulevard in just a couple of days. That's the only warning - it's addictive! I wish that the creators of this game would make a part 2, 3, and so on because they aren't enough boutiques for my taste. As opposed to something like Create A Mall that's also fun but has many more levels to complete before you're through. But all in all I recommend this without reservation.